Welcome to the Libraries at High Point University! My name is David Bryden. 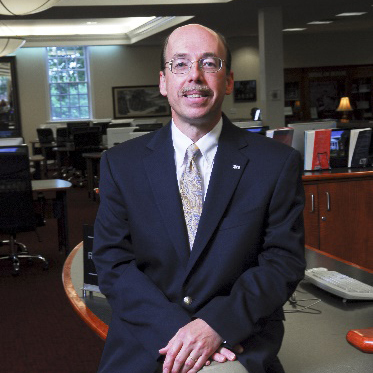 I have been the Director of Library Services since 2005, and I love every minute of my time at HPU. We have several library spaces at High Point University: Herman H. and Louise M. Smith Library is the main library and holds the majority of our book collection; the Martha Luck Comer Learning Commons in the R. G. Wanek Center is our quiet study space with a young adult and popular fiction collection; and our most recent library is the School of Education Curriculum Center in the Stout School of Education, which holds the juvenile collection and other education resources. We take great pride in our library spaces and our staff: Our librarians are the most helpful group of professionals that you could possibly find. We endeavor to make your time at our libraries helpful and pleasant. Please get in touch with me if you have any concerns or questions about our libraries, and I will help in any way that I can.